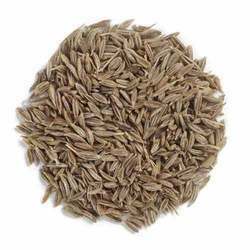 Providing you the best range of cumin seeds, high quality indian cumin seed, indian cumin seeds and ajwain with effective & timely delivery. 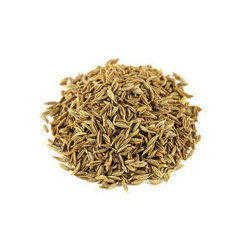 Type of Cumin Seed Available Pale Green. In regions where highly spiced foods are preferred, cumin seeds is a favourite. In fact, the world over it comes second only to black pepper as the most popular spice. Dutch cheeses and in traditional French bread. 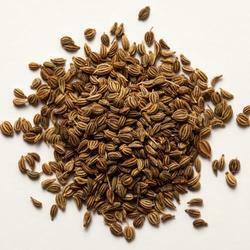 We are the leading exporter and supplier of Cumin Seeds. In terms of medicinal value, Cumin is stomachic, diuretic, carminative, stimulant, astringent and antispasmodic. It has been used to treat carpal tunnel syndrome, diarrhoea, indigestion and morning sickness. A small, slender and smooth herbaceous annual belonging to the parsley family, cumin is grown in well-drained sandy loam and medium soil. Seeds are normally ready four months after planting. Weeding is done by hand at least three to four times during the crop's life. Harvesting is done when the plant turns yellowish brown. Harvesting happens early in the morning. The cut crop is dried and threshed. Winnowing separates the seeds before manual or mechanical cleaning and packing. Cuminseeds are the seeds of Cuminum cyminum. which belongs to the parsley family. It is eliptical in shape with deep furrows. The product shall be aromatic with a penetrating flavour. The product shall be free from foreign odours and flavours. Acid insuluble ASH 1.75% Max. Packaging 25 kg & 50 lbs paper/poly bags. In regions where highly spiced foods are preferred, cumin is a favourite. In fact, the world over it comes second only to black pepper as the most popular spice. Whole Cumin has a distinctive flavour and strong, warm aroma is due to its essential oil content. It is a necessary ingredient of all mixed spices and curry powders. It is also used in some Dutch cheeses and in traditional French bread. In terms of medicinal value, Cumin is stomachic, diuretic, carminative, stimulant, astringent and antispasmodic. It has been used to treat carpal tunnel syndrome, diarrhoea, indigestion and morning sickness. A small, slender and smooth herbaceous annual belonging to the parsley family, cumin is grown in well-drained sandy loam and medium soil. Seeds are normally ready four months after planting. Weeding is done by hand at least three to four times during the crop's life. Harvesting is done when the plant turns yellowish brown. Harvesting happens early in the morning. The cut crop is dried and threshed. Winnowing separates the seeds before manual or mechanical cleaning and packing. 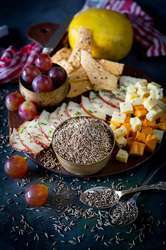 Cumin seed Ground are the seeds of Cuminum cyminum. which belongs to the parsley family. It is eliptical in shape with deep furrows. In terms of medicinal value, Cumin is stomachic, diuretic, carminative, stimulant, astringent and antispasmodic. It has been used to treat carpal tunnel syndrome, diarrhoea, indigestion and morning sickness. A small, slender and smooth herbaceous annual belonging to the parsley family, cumin is grown in well-drained sandy loam and medium soil. Seeds are normally ready four months after planting. Weeding is done by hand at least three to four times during the crop's life. Harvesting is done when the plant turns yellowish brown. Harvesting happens early in the morning. The cut crop is dried and threshed. Winnowing separates the seeds before manual or mechanical cleaning and packing. Ajwain is very aromatic but less subtle in taste. It is slightly bitter, pungent and strong. Even a small amount of ajwain dominates the taste of a dish. In India, ajwain is never used raw, but is either roasted or fried in ghee, which is done to develop a stronger and more prominent aroma. It is primary used as a digestive aid and ant emetic.The ajwains of our company are in great demand across our customer base.